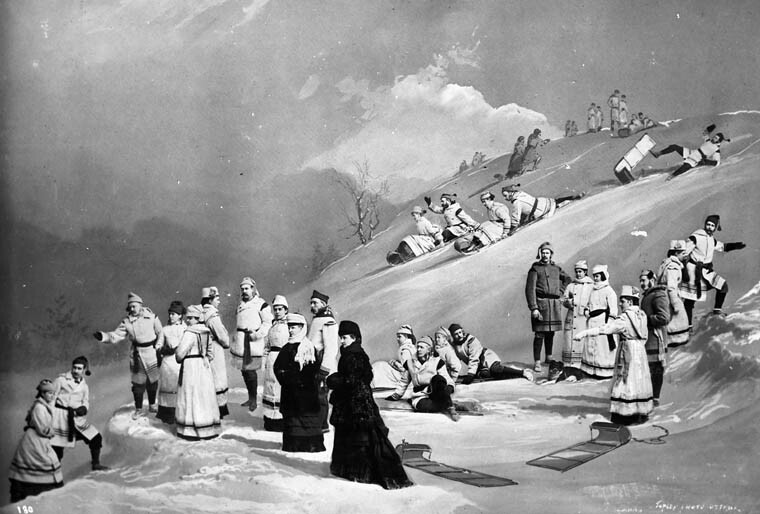 The word toboggan is probably of Algonquin origin, a Native American language with now less than 3000 speakers mainly in Quebec and Ontario. This etymology makes it a genuine American English word. 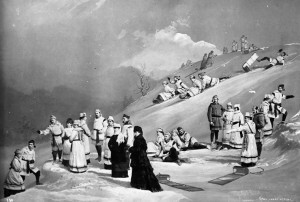 The conÂ strucÂ tion of this sled â€“ withÂ out runÂ ners on the underside â€“ made it quite suitable for transporting traps, game and other goods over deep snow. Nowadays, and probably since the middle of the 19th century, it is mainly used for fun rides as you can see in the picture. In Canada and the US you sometimes even find sledding slopes reserved exclusively for toboggans. I must admit I never rode a toboggan myself but it is an experience I definitely want to treat myself to, one day. I am afraid, however, that toboggans are a bit hard to come by here in Germany. This entry was posted on Thursday, January 1st, 2009 at 22:13	and is filed under word of the week. You can follow any responses to this entry through the RSS 2.0 feed. You can leave a response, or trackback from your own site.